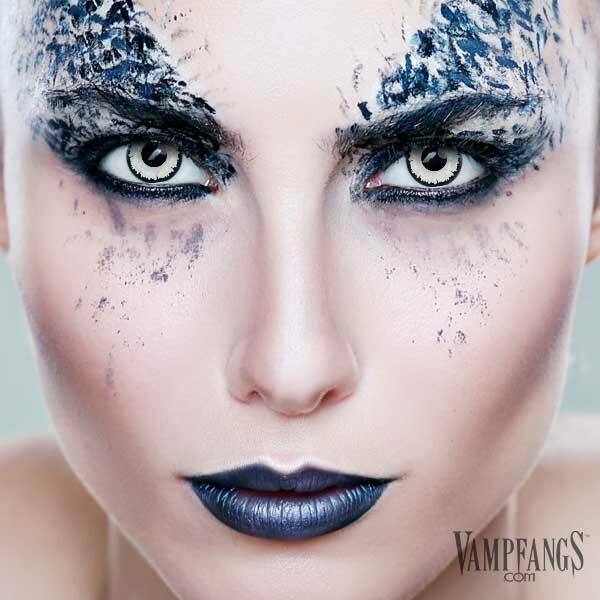 Angelic White Lenses are one of the most popular Zombie and Vampire lenses that we sell on Vampfangs. The white is so vibrant against the dark limbal ring on the edge. 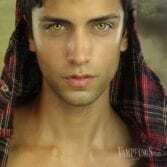 For those of you that don’t know, the limbal ring is the dark ring around the edge of the lens. This makes the lens pop in appearance and make your eyes look larger and brighter! The color is so intense…they almost glow! And with our Comfort Seal System our lenses are among the most comfortable contact lenses on the planet! 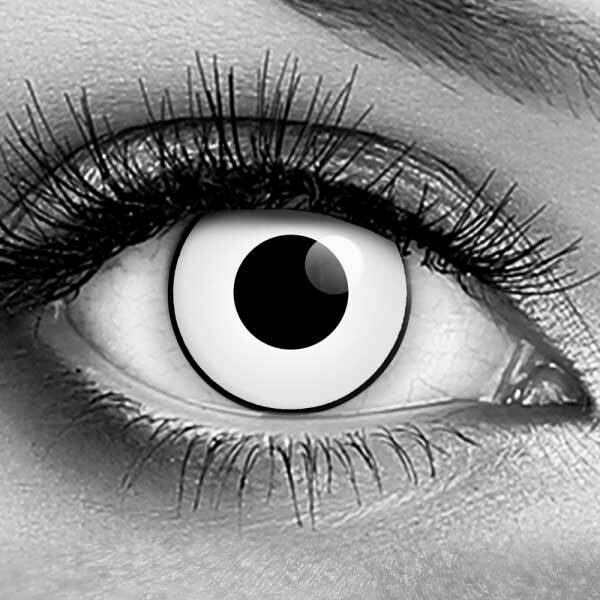 These contacts are a great addition to any zombie, demon, vampire or any undead character. 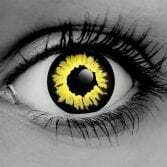 Customers have sent in some great shots of themselves using these lenses in some truly over the top zombie characters…you won’t be disappointed! They can also be used for cosmetic daily wear…although we aren’t quite sure if Angelic White will go with your everyday wardrobe! ALL Customers In The United States MUST Complete Our Prescription Verification Before Contact Lenses Can Ship! After you place your order, look for an email from us! You need to fill out a simple form before we can ship out your lenses to you, but don’t worry because the process only takes a few seconds! We already filled out most of the form for you! Read More About The Prescription Verification Process Here! The FDA and FTC watch this industry very closely. They regularly publish new articles, consumer updates, and advisories about the topic. They are aware of the illegal sellers. 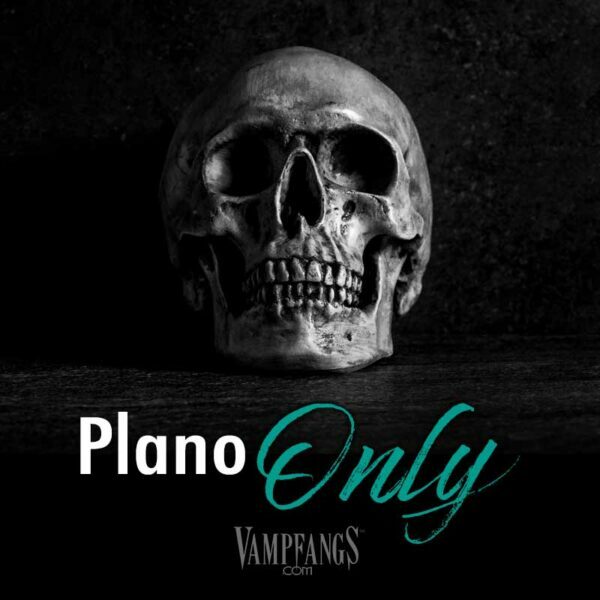 Vampfangs follows the law. Period. 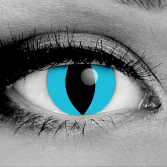 If you want to read more about buying contact lenses online, you can read our post about it here! It’s the law guys! We need that form submitted from you before we can ship, so don’t ignore that email! After you submit the form we will keep you posted every step of the way! You will be rocking those new lenses in no time! Comfort is one of the MOST IMPORTANT aspect of any contact lens. 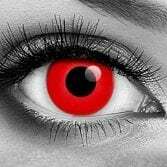 Whether it's one of our hand painted designs for the film & television industry or a pair of our premium theatrical lenses for costume or hanging out. If the lens doesn't fit and feel comfortable on your eye you are not going to want to wear it! 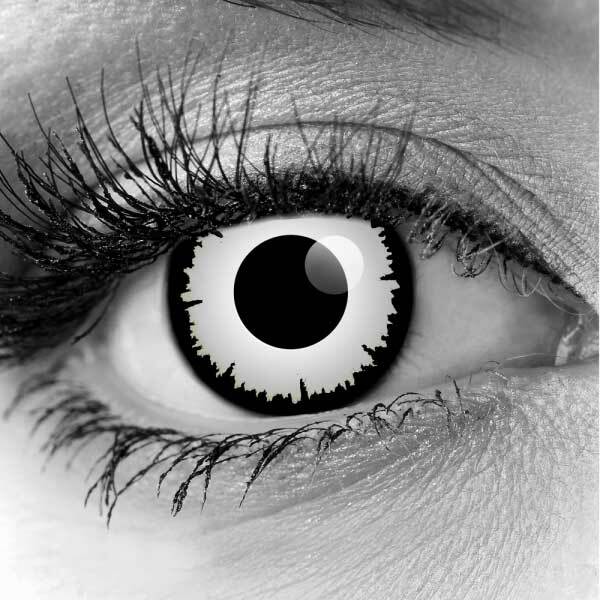 The CLS system makes our FX lenses some of the most comfortable contact lenses in the industry. The Color Lock System means that the color on your lenses is sealed inside...so there is no printing coming in contact with the inside of your eyelids. Those of you who have worn other types of lenses will appreciate just how important comfort is, and why our Premium CLS Lenses can't be beat! All of our CLS lenses are daily wear. When cared for properly, our Premium CLS Lenses last for up to ONE YEAR! ✅ All of our lenses are FDA cleared. We are serious about the safety and comfort of the lenses we offer. In order to legally purchase any contact lens we must get permission from your eye care professional. ✅ Available in corrective strengths. We are working hard to make sure that the most popular designs of our lenses are available in your particular prescription. Right now the best selling lenses can go to a -6.00. ✅ Durability. Because of our Color Lock System the lens colors remain vibrant and consistent. Our lenses are daily wear lenses and will last for one year if cared for properly. I notice the other Gothika colors has an option to select your sizes for each eye on the page before you add it to your cart, but this color does not. Does it have a corrective lense option?? I’m confused by the information listed. If the lenses are available in corrective strengths, you will be able to choose the power strengths on the product page before you add it to your cart. These lenses are not available in corrective strengths at this time. The verification process was so much easier than I thought it would be. I’ve worn the all white lenses, which are cool, but I find that these are just pretty. The black around the edge is a nice contrast to the white of my eye and the white in the lens. 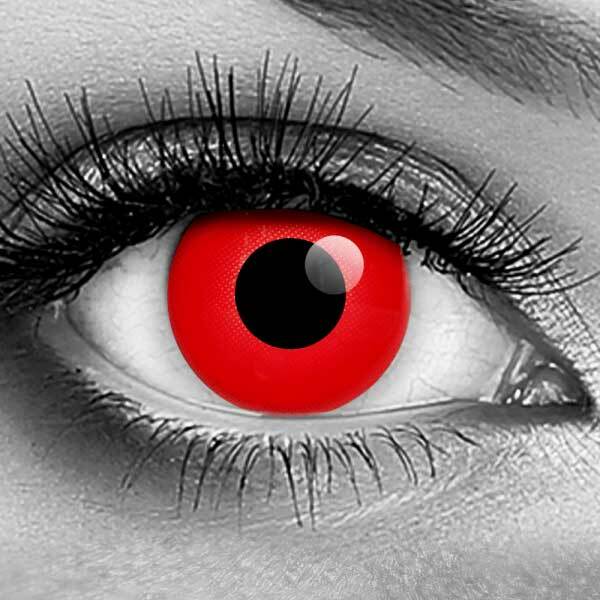 Red Vampire lenses are a best selling style of red Halloween contacts. Vibrant, opaque color. 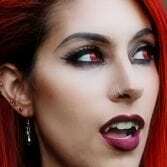 Perfect contacts for your vampire costume, cosplay, or lifestyle! *We MUST obtain approval from your eye doctor, even if the lenses are non-corrective. Federal Law requires us to verify prescriptions for ALL contact lens sales, including Plano. Read more here. 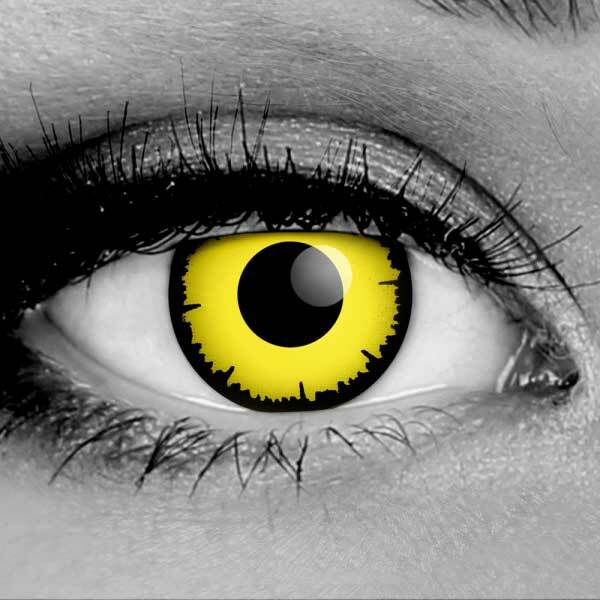 Black Wolf lenses are an amazing, natural looking black and yellow design. Top choice if you are shopping for werewolf contacts! White Manson lenses are among our most popular Halloween contacts. 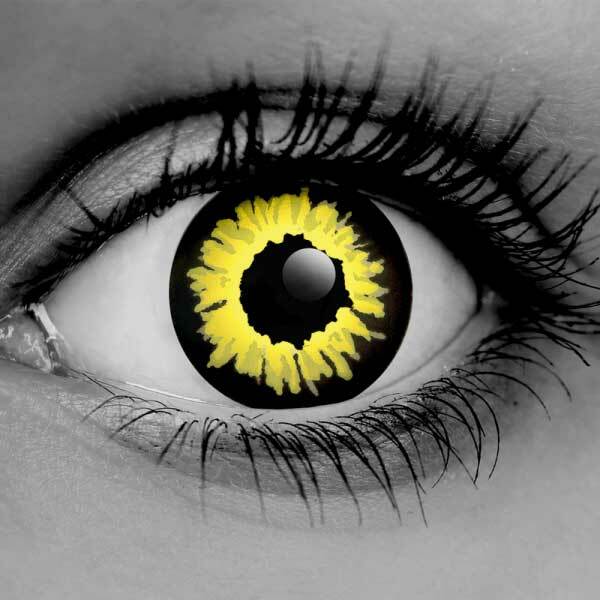 Top choice if you are shopping for zombie contacts!